After much anticipation, thousands of spectators watched on as the first spoils for 2017 were collected by 2016 Thor MX1 Champion and CDR Yamaha’s Dean Ferris in what was an eventful Round 1 of the 2017 Motul MX Nationals at Wonthaggi today. With the premier Thor MX1 class fairing some of the most talented competitors that the series has seen in years, Ferris had his work cut out for him aboard his Yamaha YZ450F in both 30 minute plus one lap motos this afternoon. The depth of talent within the class was realised from the minute bikes hit the track for qualifying this morning – the top ten separated by only 2.8 seconds. But it was experienced SD3 Husqvarna rider Brett Metcalfe who capitalised on the smoother track conditions early in the session, recording the fastest qualifying time – the only rider to dip into the 1:45s with a 1:45.332. Less than a second behind him was 2015 MX1 champ Kirk Gibbs (1:46.046), followed by Crankt Protein Honda Racing Team’s Todd Waters (1:46.266). CDR Yamaha’s Ferris and KTM Motocross Racing Team’s Luke Styke recorded the fourth and fifth fastest times, and from there the top five were through to GoPro Superpole. But when GoPro Superpole was wrapped up it was no longer Metcalfe who was fastest on track. Despite only clocking in the fourth fastest time during qualifying, CDR Yamaha’s Ferris bounced back when it counted, collecting the first Superpole victory for 2017 and three championship points with an impressive 1:45.320 lap time, ahead of Styke, Metcalfe, Waters and Gibbs. When riders lined up for moto one, thousands of spectators dotted the fence line in anticipation for the first premier class show down of the year, and when gates dropped it was Wilson Coolair Motul Factory Suzuki’s Kyle Peters who snatched up the Raceline holeshot, and put healthy distance between himself, Ferris, and DPH Motorsport’s Kade Mosig. After only two laps, Peters continued to hold off last year’s Thor MX1 Champ, while Waters managed to get by local DPH Motorsport rider Mosig to move in to third position. And from there, Waters continued to apply the pressure - with Ferris his next target, the Honda CRF450R rider closing in rapidly on the CDR Yamaha machine. But just as Waters had closed in on Ferris, Ferris closed in on race leader Peters, providing spectators with a three-way battle for the opening MX1 moto top spot. After seven laps on track, the running order saw Suzuki mounted Peters continuing to maintain control of moto one, while Ferris and Waters were locked in to their own battle for second position behind him. Local Mosig was back in fourth place ahead of Gibbs, while MX1 rookie Luke Clout (Crankt Protein Honda) was having an impressive ride in sixth position. By the halfway mark in moto one, Ferris started making passing attempts on Peters, but with rain beginning to fall, and the top riders into lapped traffic, the CDR Yamaha rider wasn’t able to make a move stick. In what was a surprise to onlookers, Waters made a mistake whilst in third place in the later stages of the moto, which saw him drop back to fourth. With only seven minutes left on the clock Peters and Ferris tightened up once again, and although both riders were making mistakes and changing lines left, right and centre on the technical circuit, the pair remained in first and second positions ahead of Mosig in third. But with one and a half laps remaining, Ferris made a pass on Peters stick, and unfortunately for Peters the bad luck didn’t stop there, Mosig also managed to get by the Suzuki rider before Peters was forced to head back to the pits with a bike malfunction. And with Peters out of the equation, Ferris was able to breeze to victory, while Mosig put in one of his best rides in more than 12 months to take second, followed by Waters who inherited third position in the opening moto. 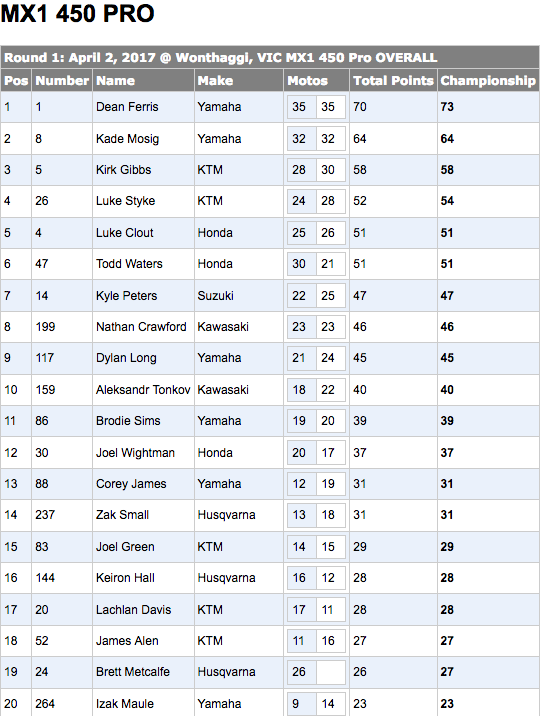 Gibbs concluded race one in fourth ahead of SD3 Husqvarna’s Metcalfe in fifth. Crankt Protein Honda Racing Team’s Clout wrapped up his debut MX1 moto in sixth position, while Styke, MEGA Bulk Fuels Kawasaki’s Nathan Crawford, Peters, and CDR Yamaha’s Dylan Long completed the top ten. When gates dropped on race two this afternoon, Crankt Protein Honda Racing Team’s Clout took the second hole shot for the day, however his teammate Waters was not so lucky, going down in the first turn, and on a mission to make up positions. But in true Ferris fashion, it took less than a lap for the CDR Yamaha rider to take control of race two, while Mosig only a lap later also made the pass around Clout to slot up into second position. Behind Ferris and Mosig, it wasn’t long before Clout had his hands full with SD3 Husqvarna’s Metcalfe, and after four laps the former AMA Husqvarna rider made the pass on the youngster for third position. Unfortunately for Clout, Gibbs also made his way around the 2017 Honda, relegating Clout to fourth, while Metcalfe went missing from the podium position handing third place to Gibbs. After nine laps on the gruelling circuit, Ferris continued to maintain a healthy two second gap on Mosig, followed by Gibbs then Clout who was beginning to feel the pressure from Wilson Coolair Motul Factory Suzuki’s Peters and KTM’s Styke. Long, who is still recovering from a wrist injury circulated in seventh position, while Kawasaki duo Crawford and Aleksandr Tonkov occupied eighth and ninth places. As moto two reached it’s closing stages, no other rider was able to match the form of CDR Yamaha’s Ferris, who looked ultra comfortable taking on the chopped up Wonthaggi circuit. And from there it was no surprise to see Ferris collect the race two victory. Second position was taken by an ‘in form’ Mosig, followed by KTM Motocross Racing Team’s Gibbs. Fourth place was collected by Gibbs’ teammate Styke who got by Clout late in the moto, while Clout completed the MX1 top five. Peters, Long, Crawford, Tonkov and Honda’s Waters completed the top ten in race two. But with 1,1 results and a GoPro Superpole victory to boot it was Ferris who collected the first round win of the season at Wonthaggi this afternoon. Second overall was taken by local Mosig, while third position on the podium was taken by KTM’s Gibbs. “You always want to come out of the first round with good points, but we maximised them today and I’m really happy with the improvements that CDR Yamaha and myself made in the off-season,” Ferris said. “This championship is deep and ultimately that’s what we want. The boys were riding really well today, and you have to work really hard to be at the front. DPH Motorsport’s Wilson Todd has raced to his first Motul MX2 round win of the 2017 race season after riding his Yamaha YZ250F machine to 1,2 results at Round 1 of the Motul MX Nationals at Wonthaggi today. With a number of riders stepping up to the Motul MX2 class from the MXD ranks, or returning from racing overseas this season, it was hard to pick who would take the first victory for 2017 on the technical Wonthaggi circuit, but Todd was dominant from the outset. In what was familiar Victorian weather, qualifying took place in chilly conditions this morning and it was a battle of the three Yamaha riders Wilson Todd (DPH Motorsport), along with Serco Yamaha pair Mitchell Evans and Jackson Richardson. But after the 15-minute timed session it was Todd who topped the time sheets with a 1:45.476 lap time, an impressive 1.4 seconds ahead of Evans and Richardson. With DPH Motorsport’s Todd taking first gate pick in race one, all eyes were on his 2017 Yamaha YZ250F as the 40 strong bikes approached the first turn, but it was Serco Yamaha’s Richardson who secured the first Raceline holeshot ahead of fastest qualifier Todd. After only two laps, Richardson stretched out his lead on Todd to a healthy two seconds, while Synep Racing’s Dylan Wills settled in to third position aboard his Husqvarna ahead of Bulk Nutrients WBR’s Aaron Tanti. As the first 30-minute plus one lap moto progressed, Richardson began to feel the pressure from an in form Todd, while Wills also attempted to close in the DPH Motorsport rider for second position. Behind Wills, Raceline Pirelli KTM’s Jayden Rykers held down fourth position after six laps on track, followed by Serco Yamaha’s Evans, Hamish Harwood (CML KTM Racing Team), Tanti and privateer Richie Evans. By the 11th rotation, riders were well into lapped traffic and DPH Motorsport rider Todd capitalised on the opportunity to make up time, closing in on Serco Yamaha’s Richardson and making the pass for the lead. Synep Racing’s Wills dropped back to sixth position at the pointy end of the moto, allowing Rykers and Evans to inherit third and fourth places. In the closing stages of race one, rain set in but Todd continued to put distance between himself and Richardson in second position – and with two laps to go, Todd was more than a second quicker than any other rider on track. From there, that’s exactly where Todd remained – controlling the race until the chequered flag flew. Richardson crossed the line in moto one in second position ahead of Rykers and Serco’s Yamahas Evans, who finished in third and fourth. New Zealander Harwood who is racing both the MX2 and MX1 categories this year finished in an impressive fifth place, while Wills, Evans, CRF Honda Racing’s Kyle Webster, Egan Mastin (KTM) and Tanti completed the Motul MX2 top ten. By the time the final moto kicked off for the Motul MX2 class, the skies had cleared and thousands of spectators watched on as the class headed out on track for their 20 minute plus one lap moto. Davey Motorsport's KTM rider Mastin got to the race lead after only the first turn, but DPH Motorsport’s Todd was once again lurking in second position threatening for the lead. In what was an upset for Serco Yamaha, moto one second place getter Richardson went down on the opening lap, and was forced to re-join the race at the rear of the pack. After only six minutes on the rough Wonthaggi circuit, Mastin looked in no way to be slowing down aboard his KTM 250 two-stroke, while Todd looked comfortable in second position ahead of CML Racing Team’s Harwood. After a tough start in moto one, Webster looked to redeem himself in race two and after five laps held down fourth position, while Serco Yamaha’s Evans slotted in to fifth. With the top two riders Mastin and Todd out in front with a healthy gap on the field, the attention then shifted to the battle for third. Webster managed to sneak up onto the rear wheel of Harwood, eventually making the pass in the front section of the track with thousands of spectators as the backdrop. 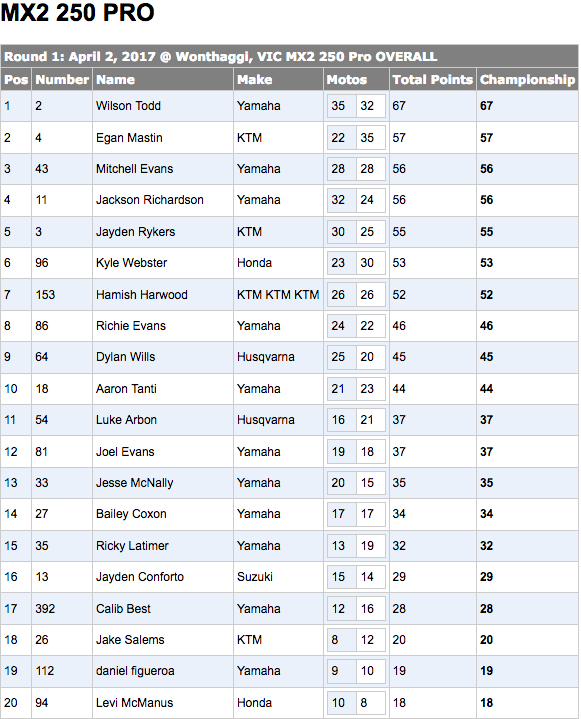 As moto two reached its closing stages, two-stroke piloted Mastin continued to lead from Todd, Webster and Harwood. Fifth position was occupied by Evans, followed by Raceline Pirelli KTM’s Rykers in sixth, and Serco’s Richardson who had made his way back to seventh from his lap one crash. But it was Mastin who was the man of the moment in moto two, putting in a flawless performance to lead from lap one to the chequered flag. Todd crossed the finish line for the final time today in second, while CRF Honda Racing’s Webster wrapped up his second outing today in third. Evans made the pass on Harwood late in the moto to finish fourth, while Harwood wrapped up race two in fifth. 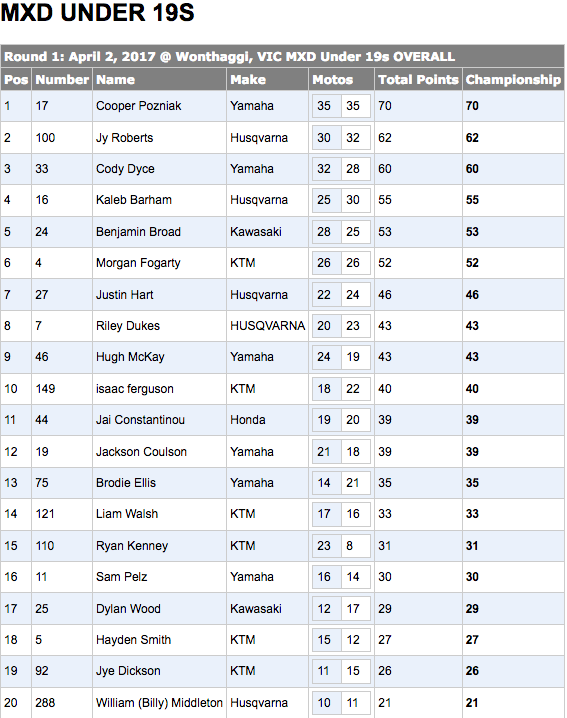 Rykers, Richardson, Tanti, Richie Evans, and SD3 Husqvarna’s Luke Arbon completed the top ten. However, with 1,2 results, it was DPH Motorsports’ Wilson Todd who concluded round one on the top step of the Motul MX2 podium, Mastin wrapped up the season opener in second overall, while Serco Yamaha’s Mitchell Evans’ consistency paid off seeing the 2016 MXD champ finish his MX2 debut in third for the round. “I’m stoked to come out this year and win the opening round. I had a lot of bad luck last season,” Todd shared. “Obviously to come out and win the first round we’ve got the season on the right track. I got two awesome starts and finished top two in both motos, so I can’t ask for much more than that. The Pirelli MXD class delivered plenty of entertainment today with Yamalube Yamaha Racing Team’s Cooper Pozniak edging out tough competition to take the first round victory at Round 1 of the Motul MX Nationals at Wonthaggi in Victoria. The development class which provides riders with their first introduction to professional racing showcased plenty of new talent across both motos this afternoon with Pozniak eventually putting together 1,1 race results rewarding him with the first round win of the season. Rookie MXD rider Cody Dyce aboard Yamalube Yamaha Racing was the fastest MXD qualifier this morning, recording a 1:51.047 lap time ahead of teammate Pozniak, (1:51.383) while third position on the time sheets was taken by Sam Pelz after he recorded his fastest lap on only his first rotation on the circuit. When moto one commenced, the Wonthaggi track had become deep and highly technical, providing the ultimate challenge for the MX Nationals Under 19 competitors. And when gates dropped, it was Yamalube Yamaha Racing’s Pozniak who secured the Raceline holeshot ahead of Husqvarna’s Jye Roberts and Yamaha mounted Dyce. However fastest qualifier Dyce was determined to move into the top spot, and within a few turns had made the pass on Roberts for second and then set his sights on his team mate Pozniak. But unfortunately for Dyce a 10 second in-race penalty for riding inside a track marker at the four lap mark hindered the Yamaha rider’s charge – Dyce was then forced to race against the clock in a dash to make up positions before the chequered flag. After 12 minutes of the first 20-minute plus one lap moto, the Pirelli MXD running order saw Yamalube Yamaha Racing’s Pozniak continuing to lead from Dyce and Husqvarna’s Roberts. Benjamin Broad (Kawasaki) and KTM SXF 250 rider Ryan Kenney held down fourth and fifth positons respectively, while Jackson Coulson, Kaleb Barham, and Raceline Pirelli KTM’s Morgan Fogarty all maintained places inside the top ten. However, with Dyce on a mission to make up time, it wasn’t long before the Yamaha MXD rookie made the move on his more experienced team mate Pozniak for first position, but with a huge ten seconds to make up in order to take the victory, it was Dyce against himself once he had a clear track ahead of him. By the time riders received the last lap board, there had been no change at the front of the pack, with Dyce continuing to tick off laps, in a desperate bid to stretch out his gap on Pozniak and Roberts to more than ten seconds. But when the chequered flag flew, Dyce just fell short in time, and despite crossing the line in the top spot, was awarded second place after his earlier time penalty. Pozniak was then handed the first Pirelli MXD race win of the season, while Roberts concluded his first 2017 outing in third. Broad, Fogarty, Barham, Hugh McKay (Bulk Nutrients WBR Yamaha), Kenney, Justin Hart (Husqvarna) and Coulson (Yamaha) all wrapped up moto one inside the top ten. By the time the Pirelli MXD class headed out for their second moto this afternoon, competitors were forced to contend with a notoriously difficult Wonthaggi circuit, and it was Pozniak who secured the holeshot once again, while unfortunately teammate Dyce showed his inexperience, going down on the first lap, re joining the race in 24th position. However, it wasn’t long before rookie Raceline Pirelli KTM’s Fogarty made his presence known, making the pass up the inside of Pozniak, and showing that despite being fresh out of juniors, that he’s racing for wins. Unfortunately for Fogarty a crash on lap three handed the driver’s seat back to Yamalube Yamaha Racing’s Pozniak, also allowing Roberts to slot up in to second position ahead of Husqvarna’s Callum Norton. The crashes continued for Pirelli MXD riders soon after Fogarty went down, with Norton becoming the next victim of the Wonthaggi circuit – crashing out of third place and handing the final podium position to Kaleb Barham. As race two entered it’s closing stages one man that crowds couldn’t keep their eyes off was Dyce, who had charged all the way from 24th place to seventh position with five minutes still left on the clock. Despite having a moment on the final lap, it was Pozniak who’s patience and consistency paid off at Wonthaggi this afternoon, crossing the finish line in first position, followed by Roberts and Barham in second and third places respectively. Fourth today was collected by Dyce who’s late charge paid off, while despite leading for a handful of laps, Fogarty wrapped up the second moto in fifth position. But it was Pozniak's consistency that paid off this afternoon - his flawless 1,1 score card awarding him with the round one overall. Second spot on the Pirelli MXD podium was taken by Roberts, while Dyce wrapped up his debut MXD outing in third for the day. “Last year I finished the season off strong and got the win at the last round so I just came here to get some nice solid points and to go 1,1 is awesome," Pozniak said. “I tried to stay smooth and consistent all day so I can’t thank my team enough for all the work they have put in to make today happen. The second round of the 2017 Motul MX Nationals will be held at Appin in New South Wales on Sunday April 23, 2017.